The last bottle was purely gratuitous. I put it into my cart because I figured it five bucks wasn’t too much to pay for a gamble. I was willing to gamble due to my previous wonderful experience with Trader Joe’s. I’m glad it was only $4.99. The back label says to store the wine horizontally, in a cool place. So that’s what I’ve been doing wrong all this time! What a horrible wine. Flat, with a cloying sweetness that just came out of nowhere. Tannins were out of whack; thinnish body. My roommate and I each took a sip of the wine and let out audible groans. It might have been that this particular bottle was baked–it had the “baked” qualities to it. But I don’t want to pay another five bucks to find out. To be fair, also, some other blogs have been kinder to this wine. Please don’t get this wine. I never thought I’d say this, but if you must, pick up a bottle of Charles Shaw instead! It’s strange being 25. I remember being a kid in grade school and looking up to the new young teachers, those who were obviously younger than people like Mrs. Donaldson or Mr. Kinter–people who had been at the game for years and years. They didn’t really know what they were doing yet, but they were bright and fun and energetic. And now I might very well be older than they were at the time. Now that I’m a quarter century old, I feel as if I should be an adult. I certainly feel adult-like at certain moments–for instance, when I cook dinner, or when I go to the Ritz-Carlton for drinks (that one time! )–but sometimes feel as if I’m a child playing grownup. I think many of my peers feel the same way. All that aside, it IS nice to get together and do grownup stuff–like hold wine tastings. My roommate and I decided to throw a wine tasting; I decided also to throw a wine tasting before that wine tasting to get the feel of things. 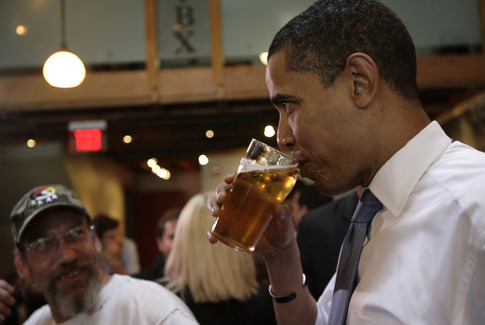 There’s an interesting article on the drinking habits of presidents and our president-elect here. America has a strange relationship with alcohol generally and wine specifically. What other country could come up with the monstrosity of “near beer”? According to Karen MacNeil, author of the fabulous Wine Bible, the American wine industry was nearly destroyed by that great experiment known as Prohibition. Part of the reason why it took so long for American winemakers to “catch up” (if that’s even occurred yet!) to their counterparts in the Old World is that long, dry hiatus from drinking and making legal wine. One could argue that American winemakers have done an admirable job of, in fact, “catching up.” What is more the issue is the perception among a huge number of Americans that wine is something fancy or foreign. Sure, wine is often used to celebrate milestones–or, in my case, Friday evenings–but wine has not as yet been incorporated into the daily lives of people in this country. And that’s a shame because wine is so delicious. And gets you drunk. But then again, the American people are getting wise. They want their cabs and now even their gruner veltliners and verdejos. And now I can imagine if I were invited to the White House for dinner (any moment now, Mr. President-Elect) I’d be able to get a glass of something decent and not a tumbler of lemonade! There are a few great things about law school. Sure, it’s a lot of work; sure, there are always things one can be doing; and sure, there’s stress, etc., etc., etc. ; but many times it beats having a job. For instance, my last class got out 20 minutes early today. After coming home from school, I lounged about for a brief and wonderful spell in bed, reading parts of Master and Commander and listening to Van Morrison. This was at around 2 pm–which would be just past my old lunch hour at LegalZoom. I got out of bed, studied a bit, tidied up the apartment a bit, and decided to go to Trader Joe’s to restock on some essentials. It was on sale for $13.99. Big deal. That’s actually kind of expensive for Trader Joe’s, I thought. But there was a sign–oh, those darned signs!–that said this was a special selection, that there were only a few cases (420 bottles total) at this store, that the normal retail was at least $26.00, and that it was 70% grenache, 20% syrah, and 10% mourvedre. I happen to like combinations of grenache, syrah, and mourvedre–I immediately think cold weather red, which is a good thing in my book. But I was torn. It was a Chateauneuf-du-Pape, and man, those Chateauneuf-du-Pape wines are usually like… $50+. How good could a Chateauneuf that’s on sale at Trader Joe’s in Washington, DC for $13.99 be? I picked up a bottle and looked at the label more closely. Cool label, heavy bottle, with a deep punt (indentation at the bottom). I saw the names “Frédéric & Daniel Brunier” on the lower edge of the label. For some reason that didn’t come to me till later, the name “Brunier” rang a bell. I decided: why not? I hadn’t bought a bottle for a while, and it was only $13.99. I am exhausted from nine hours at law school. With the exception of an hour-and-a-half gap in between for lunch and socialization, I was at it all day. With finals coming up, there is a distinct change in the atmosphere at school… people are definitely getting more stressed. Nonetheless, I finished my civ pro assignment for tomorrow, put my books in my locker, and set for home. I am cutting vegetables I bought at Eastern Market yesterday. 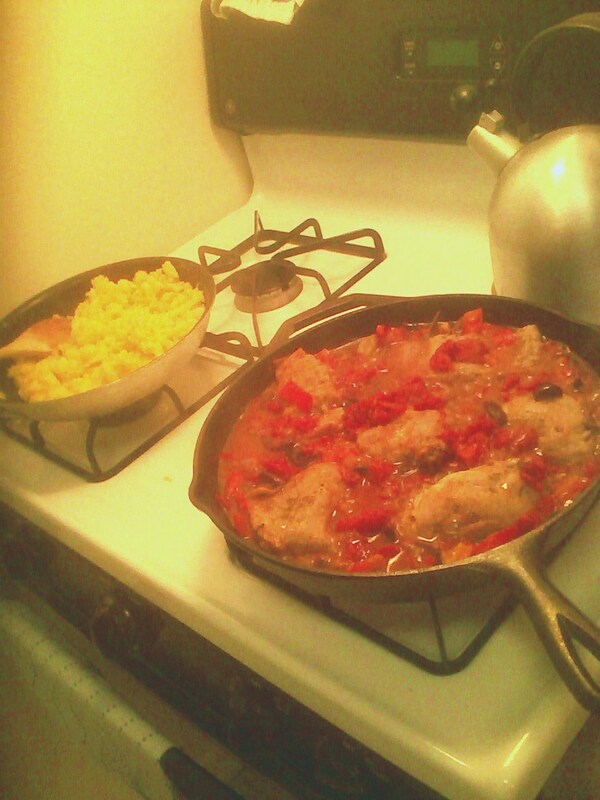 The rabbit recipe calls for two red bell peppers–I bought one red bell pepper that was streaked with green (yum!) and, for variety, two big sweet red peppers. (I cut those into pieces and, because they looked so good, ate a piece… SO delicious! I could almost eat those like fruit.) I bought a small onion. Some mushrooms. 16 kalamata olives. I had garlic at home, a big can of chopped tomatoes from Trader Joe’s… flour, check. Bay leaves, rosemary, thyme… check. The rabbit is extremely meaty. It doesn’t look so tough, either–probably didn’t spend its days foraging on some lonesome meadow a la Watership Down. The butcher cut it into six pieces–two hindquarters, two midsections/ribs, and two forequarters. Rabbit has been compared in taste to chicken… it seems that way, actually, although it has a certain characteristic of its own. I wouldn’t call it gamy, because it’s not. It’s just… well, I dunno… all I can say is that it’s the type of meat that would go well with dried herbs and rustic wines. It’s been a while, I know. I just finished a 12-page memo for my legal writing class; I have a very small window of freedom before the wheels of finals start turning. Just because I haven’t written for over a month doesn’t mean I’ve stopped drinking. Well–I’ve cut down my alcohol consumption generally, which is a good thing. (For instance, I can actually remember what I’m doing while I’m doing what I’m doing!) Nonetheless, I have had many, many bottles of wine. My original intent for this wine blog was to keep track of the wines I consumed. I’ve let dozens slip through the cracks, unfortunately. My solution for this is to post shorter comments more frequently. Occasionally–when I have time–I will post longer musings on wine and its connection to life, etc. Autumn in DC has been pretty cool–literally. Currently, it’s about 55 degrees outside. There were days of high 30s – low 40s. I’m used to short bursts of cold weather in California (especially up north), but sustained cold is something new to me. I like it, however. I don’t get all sweaty walking around; I can layer; my roommate Alex can make thick, hearty stews; and I feel more alert. Oh yeah, and there are no more darn mosquitoes to eat me alive. Concomitantly, I’ve turned away from white wines and have started to look more to reds to sustain my alcoholic tendencies. Côtes du Rhône come to mind, as do malbec from Cahors and tannat-based wines from Irouleguy. 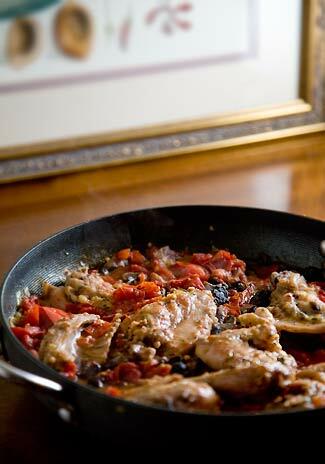 I will be making rabbit stew for dinner tomorrow (you can buy rabbit at Eastern Market for like… $3.99 a pound!) and am thinking of serving it with a Clos La Coutale from the Cahors region of France. This wine–70% malbec, 15% merlot, and 15% tannat–was one of my favorites from Kermit Lynch in Berkeley, and I was so excited to see one lone bottle at the Wine Specialist the other day… for $13.99 it was a bit more expensive than in California, but then again, we ARE on the opposite side of the US from Berkeley. I will be sure to post my thoughts on that meal afterwards–if I have the time!